This page was not planned in my original script, but I thought it would be a nice addition. Plus it would also allow to add another page I wanted to (since in an album point of view, we need to think the layout not only page per page, but also as a left and a right page!). Anyway it seems our Marmot did not think the departure through. Well you saw it, he kind of left at sunset. No surprise soon he is surprised by night! Marmots are essentially day animals. Normally you would never see a Marmot outside by night. Well it seems *our* Marmot is a little more adventurous. After all he travels, and there is like nearly no travelling marmot in the history of marmot-kind, is there?! So here we see the first encounter with all these night animals. Marmot may leave close to them all his life, and never have met them. They are like impossible encounters. To understand well which animals these are, maybe a little more background is necessary. Our hero is a Marmot from Western Europe’s Alps. Where exactly is unsure. Is it on the French side? The Switzerland? The Italian one? So at this point of the story (yes you may guess it will evolve! ), he can meet only locale species. Also the owl made some incredible display of neck flexibility. Actually owls are known to be able to turn their head 270 degrees, without any self-injury. Yeah just like an horror movie (everyone has the exorcist in mind!). So they can watch back without moving the corpse, or just have the mouth up, eyes down, or any mix. Well this too is kind of scary for the unprepared mind. And poor Marmot is ok to be scared, even though it is probably not very nice for this owl who asked nothing to none! Then we have a common bat… sleeping downside! Since Marmot loves experimenting, could he resist trying too? Of course probably the bat was not asking that much attention either. Then Marmot finds a Weeping Willow. Well looks nearly like a roof, it is made to rest, right? But weeping willow are close to water, and what else may be close to water? Beavers! And beavers don’t only like to work a lot, it turns out they also like to do it a like at night (in particular start and end of night, it would seem. But you could also see them by day). How bad luck is that for Marmot? Marmot suddenly realizes that night is upon him! He spots a friendly looking bird and tries to call it for help, but get scard away when the bird, an owl, turns its head halfway back. 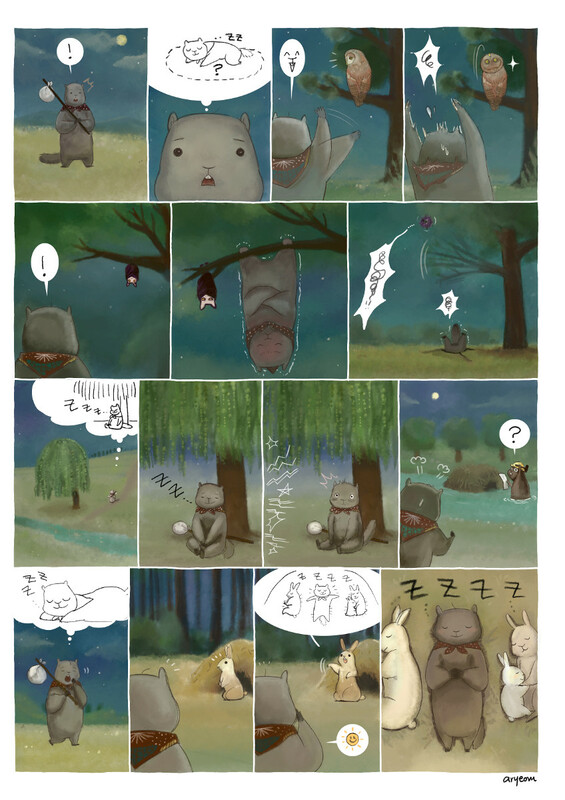 Then he spots a strange animal, sleeping head down, in a tree: a bat. Trying to do the same, just in case it may be comfortable, he falls on the ground. Later he founds a weeping willow close to a nice and calm river. Like a roof over one's head, close to water, what a perfect way to rest. But huge sounds wake him up. A beaver is working on his piece of construction: a dam in the middle of the river just a few meters from Marmot! Finally when all hope seems lost, a wild rabbit sees Marmot and proposes to share its burrow. Yeah!